London & New York: Routledge, 1999. This work brings together over 25 years of the work of Vine Deloria, Jr, once dubbed "the red man's Ralph Nader," now regarded as one of the most important living Native American figures in the late 1990s. 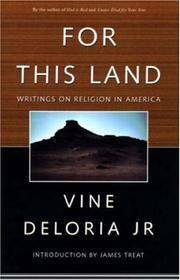 For the past 30 years, Deloria has offered contributions to understanding the complexity of religion in America. In his writings he recognizes the spiritual desperation and religious breakdown in the contemporary situation, and provides the groundwork to get people to examine what they actually believe and how they must put those beliefs into practice. The essays in this collection express Deloria's concern for the religious dimensions and implications of human existence. His writings are engaged within a theoretical system of physical, not ideological, space, and ultimately give voice to this intellectual passion by calling into question our controversial religious institutions, commitments, worldviews, freedoms and experiences. 311pp. N.B. Previous owners inscription to ffep. . First UK Edition. Paperback. Fine/No d/j as Published. 8vo - over 7¾" - 9¾" tall.